Many non-Google maps and GPS systems are not accurate to our location. Please use this map or call our tasting room 503-560-8266 for directions. Fairsing Vineyard is located off of Laughlin Road between Gaston and Yamhill. Please note, some non-Google GPS providers and Apps (“Waze”, etc) do not provide accurate direction to Fairsing Vineyard. See Google map below for our correct location and/or call our tasting room for assistance 503-560-8266. Groups of six (6) or more please contact tasting room before arrival. Picnic privileges extend to Wine Club members with a reservation. Picnics enjoyed outdoors please. Glass pours available until one hour before close. 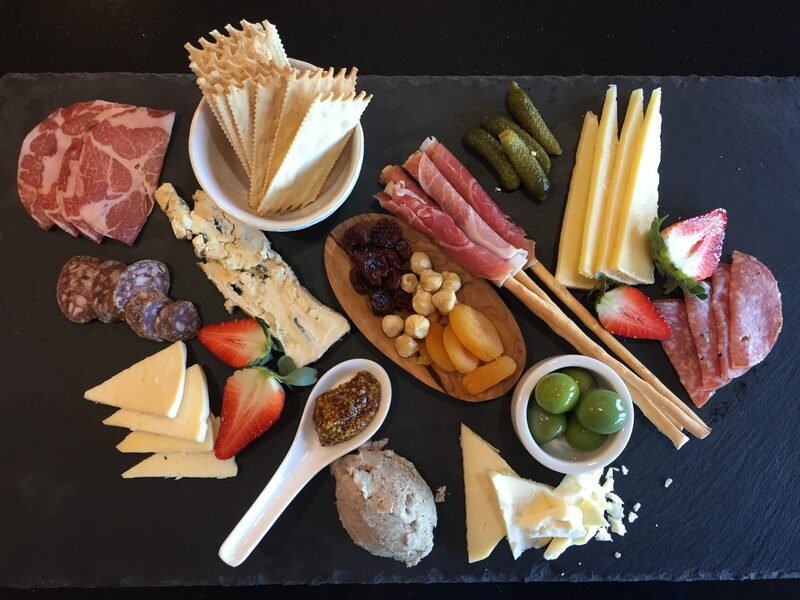 Cheese plates, charcuterie and light bites available until half hour before close (excluding holiday weekends and special events). One tasting fee waived with two (2) bottle purchase. Leashed dogs welcome (excluding holiday weekends and special events). Elevated Seated Tastings available with advance notification. 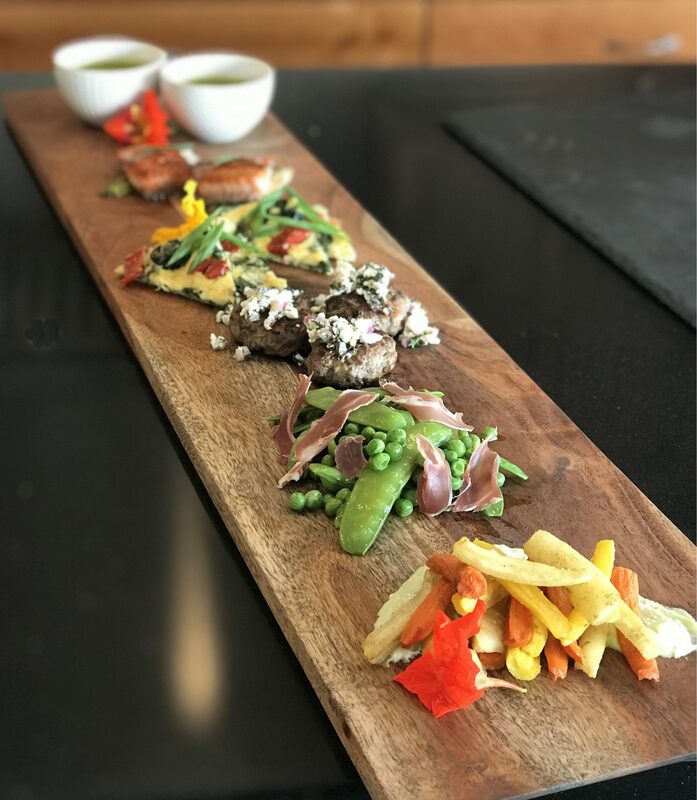 We honor two of the majestic peaks visible from our tasting room with immersive experiences featuring light bites that complement a select flight of our estate-grown wines. Reservations requested 48 hours in advance. Please call 503.560.8266. Mt. St. Helens Tasting: A generous array of selections from regional purveyors of fine cheeses, charcuterie, produce, and nuts with savory offerings from Chef Rebecca Clarke. $80 per guest | $60 Club. 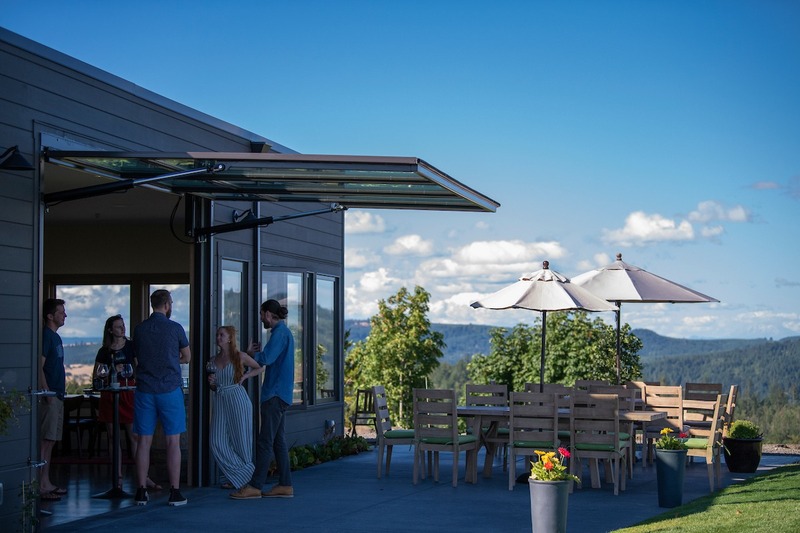 To plan and reserve space for events with Fairsing Vineyard, please contact Brandy Grey, Tasting Room Manager 503.560.8266. 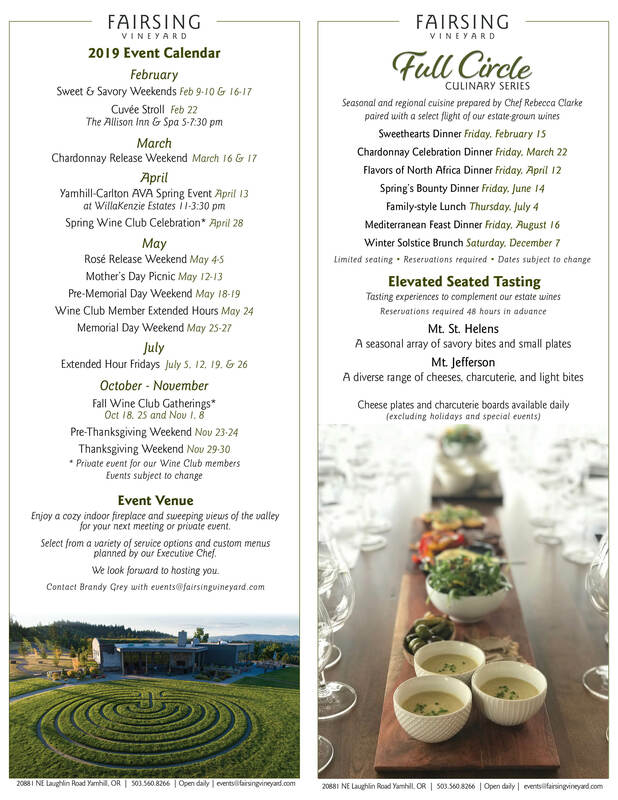 While Fairsing Vineyard does not host weddings, other event options include plated or buffet wine dinners, business meetings, celebrations and private gatherings. Our 1,300 sf event space, with cozy interior fireplace, captivating 6-foot dome skylight and windows with sweeping views of the valley, is offered 9 am to 5 pm Monday through Friday for meetings and private events. The event space or the entire facility (including 1,200 sf tasting room) are available evenings 6-9 pm, seven days a week. Maximum capacity for seated and plated meals is 25 guests. Maximum capacity for gatherings served buffet style is 50 guests. Custom menus for all events arranged by Chef Rebecca Clarke. Read more about Rebecca Clarke and her culinary career here. with inquiries regarding amenities and availability. Fairsing Vineyard is honored by reviews and favorable comments for our current release 2016 estate wines from JamesSuckling.com. Click here to read full reviews from James Suckling contributing editor, Nick Scott. Many non-Google maps and GPS systems are not accurate to our location. Please use this map or contact Fairsing Vineyard for directions to 20881 Laughlin Road Yamhill, OR 97148. The Fairsing Vineyard tasting room and event venue honor the owner’s Celtic heritage while incorporating sustainability and style. 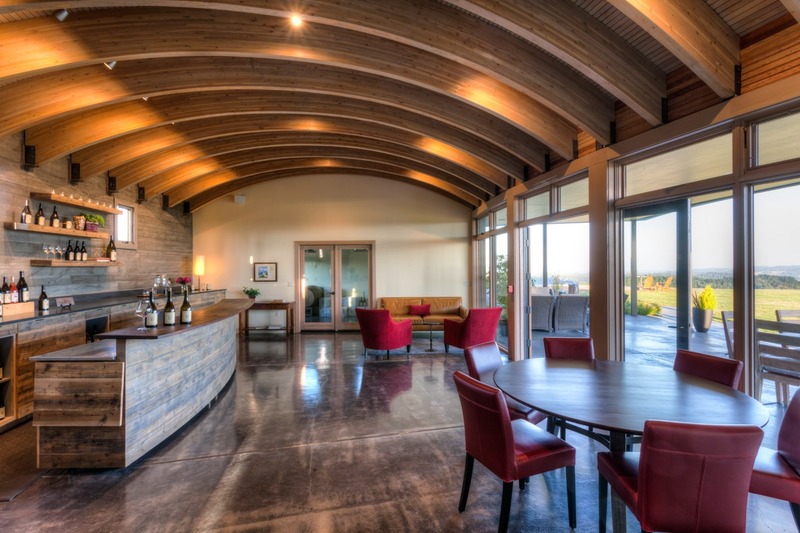 The tasting room was constructed utilizing board-formed concrete for the exterior walls and curved glulam beams for the ceiling creating a unique barrel effect for the space. The event venue, with cozy interior fireplace and domed skylight, features multiple windows and a large overhead glass door providing majestic views of the valley. Overall the building design is reminiscent of ancient structures found in the Irish countryside. 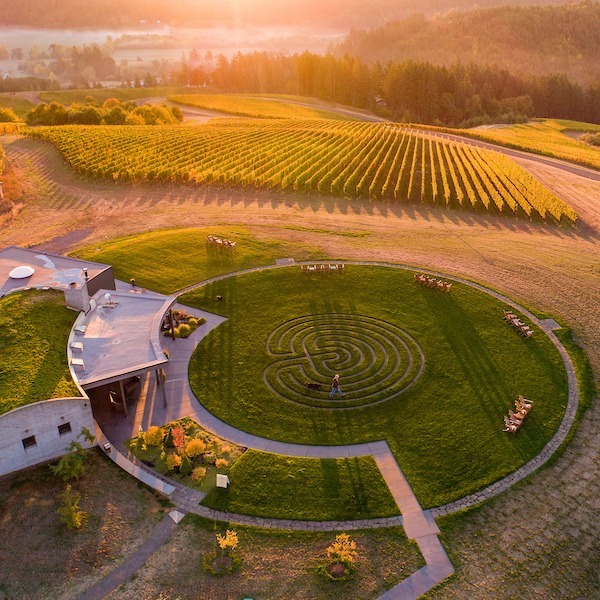 We invite you to stroll the remarkable labyrinth, sip our estate wines and enjoy the beauty and bounty of Fairsing Vineyard.